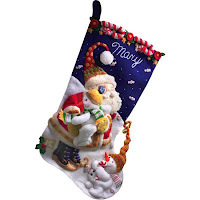 Felt Christmas stockings are a holiday tradition for many families, with each child receiving their own unique stocking design made just for them. A personalized felt Christmas stocking is a special handmade gift for any new baby or grandchild. We've added to our selection of Felt Christmas Stocking Kits with three new designs from Bucilla. You'll find them in the Christmas & Holiday Kits section of the store. The December Hugs Felt Christmas Stocking Kit is a sweet stocking design by Mary Engelbreit, featuring 2 adorable snow-kids getting hugs from Santa. Bucilla Christmas stocking kits include stamped felts, cotton floss, sequins, beads, needles, instructions, and directions for personalization. Summer is the ideal time to start on your felt applique kits for the holidays. Getting started now means your stockings will be complete in time for Christmas! 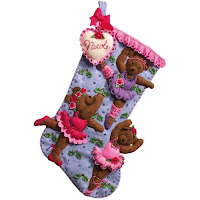 The Ballet Bears Felt Christmas Stocking Kit is a beautiful stocking design. With rich shades of pink & lavender, this is the perfect stocking for any little ballerina girl. You'll need to have a few supplies on hand to complete your felt stocking kits, including sharp pointed scissors, polyester fiberfill, ruler, tracing paper, straight pins, and pen or pencil. It's helpful to use paper plates or small containers to organize your sequins and beads. The Snow Fun Felt Christmas Stocking Kit is a cheerful stocking design with three happy snow-friends playing in the snow. Attention to detail is important when working on your felt Christmas stocking projects. Make sure to read through the instructions before starting and cut out your felt pieces one at a time as you need them. 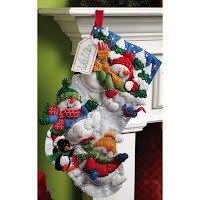 Felt Christmas stockings become favorite holiday keepsakes for children & adults. Visit the Christmas & Holiday Kits section to see all of our felt Christmas stocking kits, ornaments kits, tree skirt kits, and more! Explore a variety of Christmas kits at Weekend Kits and be ready to start crafting for the holidays on your next Weekend at Home! 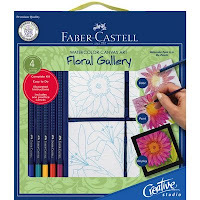 Visit the Paint & Draw Art Kits section of the store to see our newest selection of beginner art kits from Faber-Castell. 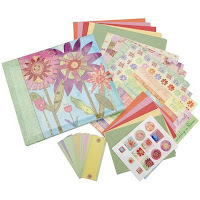 Creative Studio art kits were designed specifically for the aspiring artist and crafter. Each kit includes all the quality art materials and instruction the beginner needs to get started with confidence! The watercolor canvas art kit includes 4 pre-printed canvas boards, 1 practice canvas, 5 Faber-Castell Aquarelle watercolor pencils, 1 watercolor brush, 1 pencil sharpener, 4 foam mounting boards, 1/4" ribbon for hanging, and a 12-page instruction booklet. You'll learn the step-by-step process for creating these colorful floral canvas paintings. The canvas boards are pre-printed with the outline of the design. The first step is to color in the design using the watercolor pencils. Then, you simply blend the colors using the watercolor brush. You only need to dip the brush in water since the watercolor paint is contained in the pencil color. Use your creativity when selecting colors for the floral designs. Select colors that coordinate with a specific room in your home. Create one using your best friend's favorite colors and surprise them with a custom canvas art gift made just for them! 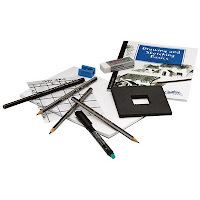 The drawing & sketching set includes 3 Faber-Castell graphite pencils, 1 medium charcoal pencil, 1 black artist pen, 20-page spiral-bound drawing sketchbook, 3-3/4" square view finder, clear copy grid, 1 pencil sharpener, 1 pencil eraser, and a 24-page illustrated instruction booklet. Drawing and sketching are foundational art skills. This drawing kit is ideal for the beginner artist or anyone wanting to learn basic drawing skills. You'll be encouraged to use the quality art tools & supplies provided in the kit to practice all of the tips & techniques you learn. 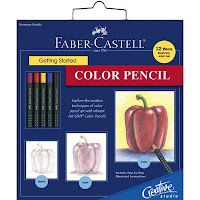 The color pencils set includes 5 Faber-Castell colored pencils, 10 sheets of assorted drawing papers, 4 rubbing papers, plastic rubbing plate, pencil sharpener, and a 12-piece illustrated instruction card pack. This drawing kit teaches a variety of color pencil art techniques for the beginner to practice. You'll learn to layer and blend the colors included in the kit to create many different shades and hues. You'll find these kits, along with our complete selection of beginner art kits, in the Paint & Draw Art Kits section. Art sets make it easy to learn a new skill. All of the of the tools & supplies you need in one convenient kit. Explore a variety of beginner art kits at Weekend Kits and be ready to create a work of art on your next Weekend at Home! You'll find new kits in the Kid's Craft Kits section of the store. Kid's are naturally creative. Encourage their creativity with craft kits designed to make learning new skills easy & fun! We have 3 new craft kits from ALEX, a respected and trusted brand name, known for producing high quality arts and crafts products for children. 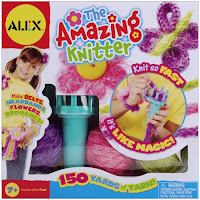 The Amazing Knitter Kit is a knitting activity kit for kids. Kit includes knitter's tool, knitting hook, sparkly yarn, embroidery floss, brooch pins, buttons, and easy instructions. Kid's will learn to make fun fashion accessories, including belts, headbands, flowers, and brooches! Kit includes 150 yards of yarn in 3 modern shades of purple, pink, and green. This is a convenient craft kit for kid's on-the-go. Kid's will stay busy knitting while traveling by car or plane. The Amazing Knitter is a quick, easy, & fun way to knit! The Origami & Kirigami Kit is a fold & cut paper art activity kit for kids. 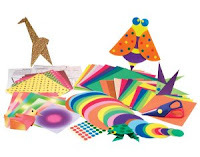 Kit includes over 200 sheets of origami paper and stickers, including an assortment of colors, shapes, and sizes. Origami & Kirigami combines 2 traditional Japanese art forms of folding and cutting paper to create a variety of animal forms and decorative designs. Learning new skills builds confidence! 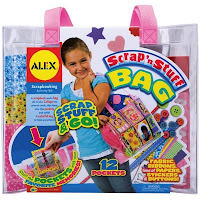 Alex craft kits include materials, tools, and easy instructions. The Origami & Kirigami Kit is a Dr. Toy's 100 Best Classic Toys award winner. 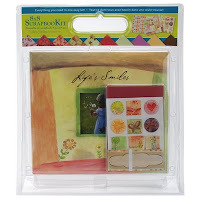 The Scrap 'n Stuff Bag Kit is a scrapbooking craft kit for kids. 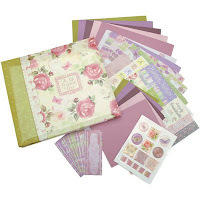 Kit includes scrapbook bag with 12 pockets, assorted colored paper, fabric, ribbons, sticky felt, buttons, white glue, stencil sheet, alphabet stickers, sticky dots, and easy instructions. Kid's will have fun making collage cards to slip into the pockets. Add photos of favorite memories, drawings, and embellishments to the precut cards to create a one-of-a-kind scrapbook bag. Use it to carry craft projects, photos books, and more! Visit the Kid's Craft Kits section to see our complete selection of creative project kits for kids. Explore a variety of craft kits for adults and children at Weekend Kits and get the family ready for a creative & fun Weekend at Home!